Church members originally met in a stable. 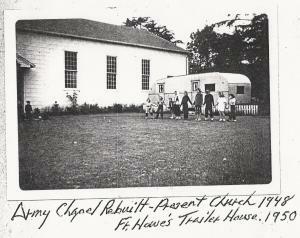 At the end of WWII church volunteers drove to Oregon, dismantled a surplus army chapel and drove it back to Crescent City where it was rebuilt. This chapel still serves as the church today. Sunday School continued to meet in the Pony Stable located on the property. The church grew to an attendance of 65 in the first 10 years. 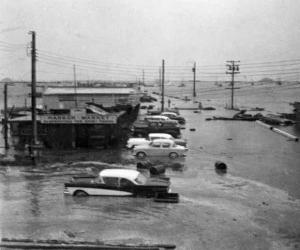 Three earthquakes registering 6.3, 6.2 and 7.1 hit the Crescent City area causing widespread damage. Church members worked together to help others. The first community dinner is served feeding a variety of community members at the end of each month when needs are at their highest. This event continues today. Today St. Paul’s has regular Sunday service at 10am each week with adult education immediately following. The congregation numbers approximately 20 people each Sunday. his job was "too soft," had asked for transfer to "the toughest nut you've got." Episcopal Bishop Noel Porter of Sacramento surveyed his Northern California diocese, at length sent the Rev. Robert Ray Read to two struggling missions in rugged, mountainous, sparsely populated Siskiyou County: Dunsmuir (pop. 2,500), a lusty railroad division point, and Mc-Cloud (pop. 1,900), a lumber town 16 miles away. ministers really had to work, instead of keeping office hours." He had to work to stay alive: he got only $600 from the two missions, plus a $600 travel allowance from the diocese. He also had to build up his congregations; the average Sunday attendance at Dunsmuir was nine, at McCloud only six. how much Mr. Read does for people, helping sick bodies as well as souls. He works in a conspiracy of silence. He won't tell what he's done." 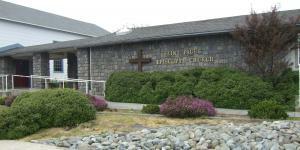 Today there are 30 communicants at McCloud, and Dunsmuir has a combined church and Sunday school membership of 100. Each Sunday Pastor Read holds a 9 a.m. service in the white-painted, frame St. John's Church McCloud, gives a ten-minute, one-point sermon. Then he hops into his secondhand Chevrolet, drives over a mountain road to Dunsmuir and conducts 11 o'clock services. 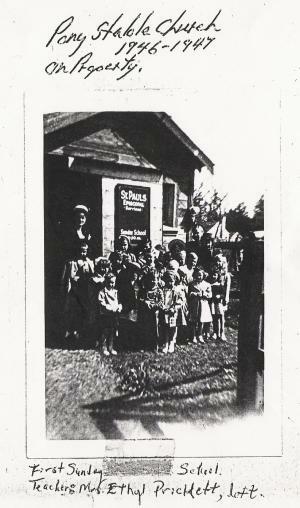 In 1950 both missions paid their diocesan assessments in full, Dunsmuir for the first time in 15 years. Dunsmuir has also cut its mortgage in half to $614.06. When Bishop Porter makes his next visit to the two missions, 25 adults and children will be ready for confirmation.